Long story short, the book she read features two female characters (a college student and her single mom) who find romance with two wonderful men. Both guys are sweet, patient, and devoted to their women. The reviewer’s comment got me thinking about the kind of leading men I like to write about. While my male characters hold a variety of jobs—ranging from a policeman to a math teacher to an entrepreneur—they all have one thing in common: They are saints. They are not saints in the religious sense, but they have the heart of a saint. I love writing about men who will go the extra mile for the women they love. Men who are strong and gentle. Men who put others before themselves. I didn’t realize my male characters had these traits in common until I saw that reviewer’s comment. It shouldn’t have come as a surprise though. God blessed me with a husband who is the inspiration for all of my leading men. I never knew unconditional love until I met David. Throughout our marriage, he has been the hands and feet of Jesus to me. His care for me allows me to experience the Lord’s patience and grace in a tangible way. He also showers this same deep and compassionate love upon our children. David is in no way a perfect man (he would be the first person to tell you that! ), but he comes pretty close in my book. This is why I write leading men who are just a tad short of amazing. I know they exist, and I also want my readers to know they exist. What kind of leading man do you like to read about? I’d love to hear what you think! I look forward to reading your answers. Giveaway: I’d like to give away one digital copy of a book from my backlist (boxed sets not included). Two winners will be randomly chosen from the comments below. The giveaway will remain open until midnight on Wednesday, March 21st. 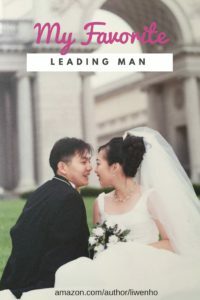 Hi Liwen, great photo of you and your husband- I love hearing how God blesses relationships. I would have to say the same- favourite leading man- strong and gentle, patient and able to see the big picture. Hi Wemble! Thanks so much. It’s hard to believe that engagement photo was taken about 18 years ago! Yes, I agree with being able to see the big picture—that’s so important. Thanks for reading and commenting! I like your idea of leading man and find it endearing that they are based off your husband. How sweet. I hope he knows all you’ve said about him today. I wouldn’t trade my husband for any leading man in any book I’ve read. I’m pretty sure there are amazing characters out there, but my real life man is just the right one for me. I love that wedding photo of you and your husband! I don’t necessarily have a favorite leading man type. I’ve enjoyed books that feature the strong/silent/brooding type to the gentle/compassionate type. If the story and the writing is good, I’ll generally like the hero of the book. Hi Liwen! Delightful wedding picture. Always fun to learn more about where authors get their inspiration for characters. Thanks for sharing. Enjoy your weekend. Hi Renate! Thank you. It was a very posed shot for our engagement album, but we had fun that day. :) Happy weekend to you, too! That is such an adorable photo of you and your husband. I can see the joy on your faces! My husband and I have been married for 35 years and each day is an adventure. Hi there! Thanks! I think we were feeling silly because the photographer told us to get closer. :) Oh wow, happy 35 years to you and your hubby! What a blessing. I like to read about a leading man who is strong in faith. Hi Mimionlife! Yes, a man who is strong in his faith is definitely attractive. :) Thanks for reading and commenting. Wonderful picture! My husband is the strong gentle type. He isn’t very romantic but he is there for me day in and day out for close to 38 years. We picked out our own chocolate at the grocery store on Valentine’s Day on the way to dinner ! I enjoy reading about different types of heroes. Thanks for writing ! Hi Diana! Thank you! Aww, it sounds like you two are romantic in your own way. :) 38 years – congratulations! :) Thank you for reading and commenting. I’m glad you included a picture of the two of you :-) I do like reading about a leading man who cares about pleasing the woman in his life, and is willing to do “unmanly” things to accomplish that. Hi Margaret! Haha, glad you like the old photo of us. :) A man willing to do “unmanly” things! I like that idea. I may need to include it in a future story. I love to read about men with all the qualities you talked about. I love this: “Throughout our marriage, he has been the hands and feet of Jesus to me. His care for me allows me to experience the Lord’s patience and grace in a tangible way.” That’s the way I feel about my husband, and that’s the type of character that I like to read in books. My husband helps me to know Jesus better. I love a man that is willing to go the extra mile to help the woman he loves! that is true in books as well as real life! Hey Liwen. I’m chiming in to agree. Men like that do exist. I got one too. And I love writing about them. Love the reminder that the relationship between author and reader can be a dialogue. So excited that a reader’s comment brought you clarity. Hi Anitra! Lovely name, by the way. :) Yes, you say it so well. I love hearing from readers. Hearing from them really helps pull me out of my own little world and makes me think about what I write. Thanks for reading and commenting! I had a man like that and lost him in 2010. I still love him. I would love to win this contest. My birthday is the 21st and I will be 65. I am an avid reader and I love your books. Thank you for this great opportunity. I like reading about men who always strive to do the right thing. This thought is somewhat random but I also like to read about leading men who have a pet dog. I love your heroes. I also love men who are just shy of perfect in a realalistic way. Good men are out there and young women need to know that. There are men who can love God and their wife and resist the world. Keep doing what you’re doing. Hi Amy! Yay for almost perfect men. :) Yes, I totally agree that there are good men out there worth waiting for. I have stumbled on your site, before reading any of your books, but you sound like an author I will love! The description of your heroes is just the kind of man my father is and my brothers are, the kind of man I want to share my life with. Hi Susan! Oh, how cool, I’m glad we crossed paths online. :) It’s so great you are surrounded by such wonderful men in your life. I like leading men who are strong yet sensitive. Strong to protect me and our love. Sensitive to show empathy and caring towards me and others. How he treats his mother and animals is a good indication of his heart. Hi Debra! Yes, I wholeheartedly agree with the sensitive part. I love it when men show a softer side. I love the leading man to be strong, protective, caring and compassionate. The guy who would go the extra mile for the one he loves. My husband and I will be celebrating our 45th wedding anniversary this coming June. We went through the time when we each picked out things for each other for special occasions. After all of these years my husband struggles to get me something that I would love and don’t already have. So now he lets me get what I want which he knows will give me great pleasure. It is simple things like a pretty bouquet of flowers that bring joy to me.